The Agapanthus cottage is part of a stunning and high security 2 acres property, located in the select upper Constantia, right at the foot of the densely forested eastern slopes of Table Mountain. The property is opposite to the Cecelia forest, less than 2km away from the world famous Kirstenbosch garden (only 2mn to get to the entrance on Rhodes drive side). Nature lovers will enjoy the kilometers of unspoiled hiking trails directly from your front door. For gourmet food lovers, 4 of South Africa's best rated gourmet restaurants are within a 5 minutes drive: The Greenhouse at the Cellars Hohenort, La Colombe, Chef Warehouse at Beau Constantia and the Foxcroft. - an open plan room with a dining area and a living room with french designer Roche Bobois leather sofa and glass coffee table, a flat screen TV with full satellite DSTV bouquet, a DVD player + a selection of DVDs, a sound system with a selection of CDs, a bookcase. - a fully equipped kitchen and back kitchen with Nespresso coffee machine and filter coffee maker. - a daily housekeeping service with the exception of week-ends & public holidays. The rooms are serviced with quality cotton linen and towels are provided (including pool towels). We fell in love with Cape Town and the beautiful and green Constantia area. We bought the property 5 years ago and made a lot of changes to build an enchanting child friendly and eco place. 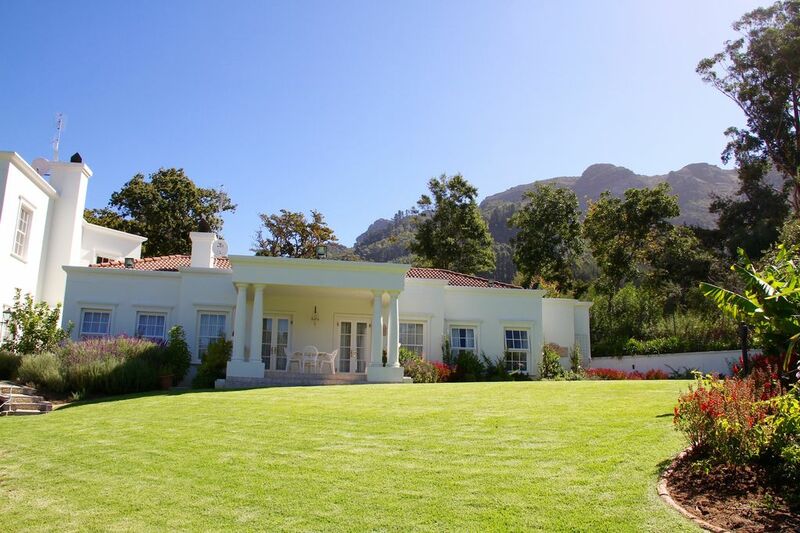 The property is ideally located on Rhodes drive in the Constantia wine valley. "Rhodes Drive is a 7 km mountain drive along the eastern slopes of the Table Mountain range and connects Constantia Nek in the south with the suburb of Newlands. This is one of the most scenic wooded drives on the Cape Peninsula and traverses some of the plush suburbs of the Southern Peninsula. It is also the only access road to the world famous Kirstenbosch Botanical Gardens. From dense indigenous forests, to towering old pine trees, majestic mountains, hiking trails, picnic spots and world class botanical gardens - it's all there along the wonderful Rhodes Drive" (cf. southafricamountainpasses). The property has beautiful mountain view, is very well protected from the wind (which can be a nightmare elsewhere in Cape Town) and has a wonderful and colourful garden, a paradise for birds and butterflies. We have 2 massive and very old trees (an avocado which produces tons of delicious fruits all year long and a yellowwood ) and more than 20 different varieties of fruit and nut trees. Everything that grows in our garden is organic, from the grass to the flowers and the fruits and vegetables. The property is half surrounded by the Green Belt and opposite to the Cecelia Forest (Table Mountain). Nature lovers will enjoy the kilometers of unspoiled hiking trails directly from your front door. Alternatively visit 6 leading wine estates (Constantia Glen, Groot Constantia, Beau Constantia, Buitenverwachting, Klein Constantia & Eagle Nest) all within a 10 minutes drive. For gourmet food lovers, 3 of South Africa's best rated gourmet restaurants are within a 5 minutes drive: The Greenhouse at the Cellars Hohenort, La Colombe and the Foxcroft.